have telecom, internet and media markets become more or less concentrated over time and how do we know one way or another? Answering this question is difficult because good data is hard to come by and the issue is highly politicized. As Philip Savage notes, debates over media concentration in Canada “largely occur in a vacuum, lacking evidence to ground arguments or potential policy creation either way”. As a result, the public policy record groans under the weight of “expert reports” bought and paid for by vested interests. This report, which is conducted independently thanks to funding from SSHRC, analyzes concentration trends across the largest sectors of the telecoms, internet and media industries between 1984 and 2015: wireline and mobile wireless telecoms, internet access, television distribution (cable, satellite & IPTV), specialty and pay television, broadcast television, radio, newspapers, magazines, search engines, social media, internet news sources, internet advertising, desktop and mobile browsers and desktop and smart phone operating systems. These are the core elements of what I call the network media economy. Concentration trends are assessed sector-by-sector, and then across the telecoms, internet and media landscape. Two common analytical tools — concentration ratios (CR) and the Herfindahl-Hirschman Index (HHI) – are used to judge whether markets are concentrated or competitive, and to chart the trends one way or another over time. We have also made all of the data underlying this report available. It can be used for non-commercial and educational purposes on the basis of the Creative Commons license. A link to the workbook can be found here. A PDF of the full report can be downloaded here. Previous versions can be found for 2014, 2013, 2012 and 2011. To some, studying media concentration in an age of the internet and information abundance is anachronistic. As we showed in our last report, the total size of the network media economy has nearly quadrupled in size from $19.4 billion in 1984 to $78 billion last year. Fundamentally new segments have been added to the media economy during this period: mobile wireless, internet access, internet advertising as well as pay and over-the-top TV services, for example. Currently, sixty hours of video are uploaded to Youtube every minute; there were about 4 million Netflix subscribers in Canada at the end of 2015; roughly 20 million Canadians had a Facebook account and many of them rely on the social networking site to get and share “the news”; expert blogs abound; pro-am journalists and whistle-blowers can set the news agenda; millions of websites are a click away; 684 TV services were licensed for service in Canada in 2015, 1085 radio stations and 99 paid daily newspapers; the majority of Canadians have a smartphone; access to a world of information is easy; and Canadians are very extensive users of all kinds of different information and communications technologies. How can media and internet concentration possibly be a problem in this context? The first school of thought sees only blue skies ahead for the network media economy. If there was ever a golden media age, this is it, argue Thierer & Eskelen, 2008. MIT media economics professor, Ben Compaine (2005) offers a terse one-word retort to anyone who thinks otherwise: Internet. Canadian media consultant Ken Goldstein agrees (see here and here). The problem is not media concentration but media fragmentation, he argues. These views are shared by Canada’s largest telecom and media companies as a matter of course. As BCE said in 2013, critics allege that media concentration in Canada is high, but the evidence “regardless of the metric employed – proves otherwise” (Bell, para 46). Furthermore, any attempt to shackle traditional media companies with ownership restrictions will likely put them at more of a disadvantage than they already are in the face of fast growing competition from global digital media behemoths such as Google, Amazon, Netflix, Facebook, and so on (Skorup & Thierer, 2012; Dornan, 2012). Again, Bell underscores the point in its 2015 Annual Report: “digital advertising revenues . . . [were] lower . . . due to [the] continued shift of advertising dollars to global players like Google and Facebook” (p. 68). The lobbying agenda around these issues has certainly heated up in the last year as well as the new Trudeau Government found its place. The Liberal Government needs to do away with outdated regulation, a recent C.D. Howe report asserts, and stand aside and let the telecoms-internet and media giants compete amongst themselves for whatever temporary dominance they might gain, as C.D. Howe has argued before. Old laws need to be dismantled, a few new rules should be adopted to match the new technological conditions at hand, and matters would be best dealt with mainly through competition law and by having the CRTC’s sails trimmed, urges the report. Otherwise, the incumbents’ attempts to invest will be futile, the results of government intervention perverse, and short-term gains for consumers offset as the development of next generation broadband internet capabilities are put in jeopardy. Similar arguments are not hard to come by in the policy-think-tank-sphere, as recent reports from the Fraser Institute, the Montreal Economic Institute or the MacDonald Laurier Institute that echo these sentiments also attest. This rhetoric of futility, perversity and jeopardy, however, also sounds a lot like the “rhetoric of reaction . . . in which conservative public figures, thinkers, and polemicists have been arguing against progressive agendas and reforms for the past two hundred years” (Hirschmann). A second school of thought which includes prominent critics of media concentration such as Robert McChesney (2014) argue that, although there is no doubt that the digital revolution is radically changing the world, it is becoming clear that core elements of the internet are no less prone to concentration than traditional media. Ben Bagdikian also argues that when we look at the latter, the number of media firms in the US that account for the majority of revenues plunged from fifty in 1984 to just five in the early days of the 21st Century. Canadian critics decry what they see as similar trends, and the debasement of news and the political culture of the country that has ensued as a result (here and here). Moreover, the internet, critics argue, is draining dollars away from newspaper advertising and exposing a fundamental reality of news: most people don’t want to pay for it. Consequently, the number of newspapers and full-time journalists in the US and parts of Europe are in free fall, while under-employed journalists are turning to public relations in droves (McChesney, 2014). Similar trends apply to Canada, but have lagged behind the US by a couple of years (see the last report on this point). A third school aims to detect the influence of changes of media ownership and consolidation by quantitatively analyzing reams of media content. They generally find that the evidence is “mixed and inconclusive” (here and here). Such findings, however, proceed as if ‘impact on content’ is the only concern, or as Todd Gitlin put it, as if ‘no effect’ might not be better interpreted as preserving the status quo and thus a significant problem in its own right. To my mind, reducing the range of questions at hand to a focus on content is akin to trying to draw a camel through the eye of a needle. A fourth school of thought, and one that I largely subscribe to, agrees that the shift from the industrial media of the 19th and 20th centuries to the digital, internet-centric media ecology of the 21st century does entail enormous changes. However, it also argues that these changes entail an equally momentous “battle over the institutional ecology of the digital environment” (Benkler, 2006, ch. 11). From this perspective, the history of human communication is one of recurring ‘monopolies of knowledge” (Innis, 1951) and oscillations between consolidation and competition (John, 2010; Babe, 1990). Why should our times be any different (Noam, 2009; Noam, 2016, Benkler, 2006; Wu, 2010; Crawford, 2012)? This approach shares some similarities with the critical school in its insistence that core elements of the network media ecology and internet are no less prone to concentration than previous media. However, it breaks ranks on the grounds that while concentration is possible, it is not inevitable, and there are cross-cutting trends across media, over time and between countries. Moreover, outcomes turn on the specific configuration of technology, markets and politics that prevails in any given time and place. There is also more attention to empirical evidence as well as the details of specific media companies and markets in the thinking that informs this report, relative to most critical approaches and those who suggest that things are just fine. From this perspective, the core elements of the networked digital media may actually be more prone to concentration because digitization magnifies economies of scale and network effects in many areas: mobile wireless (Rogers, BCE, Telus), search engines (Google, Bing, Yahoo, DuckDuckGo), Internet access (ISPs), music and book retailing (Apple and Amazon), social media (Facebook), browsers, operating systems, and access devices (Apple, Google, Nokia, Samsung). At the same time, however, digitization and the internet reduce barriers to entry in others areas, thereby allowing many small players to flourish. A two-tiered digital media system is emerging, with many small niche players revolving around a few enormous “integrator firms” at the centre (Noam, 2009; Wu, 2010). Reflecting on the results of a thirty-country study, Noam (2013) finds that media concentration levels around the world are “astonishingly high” (p. 8). Three years after first making this preliminary observation, Noam (2016) continues to maintain that concentration levels for mobile wireless and other “platform media” are “astonishingly high” (see p. 25 and especially chapter 38, pp. 1307-1316). 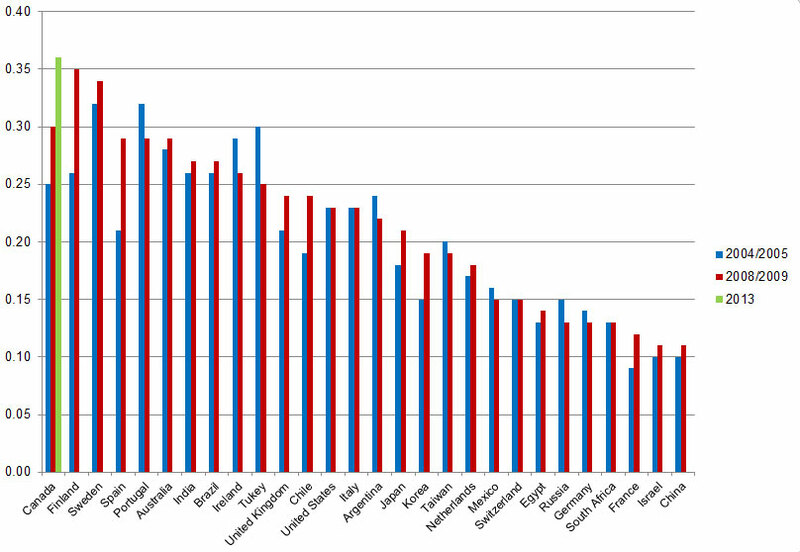 Insight into whether Canada ranks high, low or in between by international standards can be seen in Noam’s study, and the discussion that follows, especially around the issue of vertical integration. Why Media Concentration Matters, or Who Cares? These issues matter because the more core elements of the networked media are concentrated, the easier it is for dominant players to exercise market power, coordinate their behaviour, use tactics that aim to preserve their entrenched stakes in ‘legacy’ media sectors (e.g. television and film), lock up and leverage premium content to sell subscriptions to their more lucrative mobile phone, internet and cable services, stifle innovation, influence prices, work against market forces and subordinate the interests of consumers, citizens and the economy and society to their own interests (see here, here, here, here and here). Large consolidated telecom, internet and media giants also make juicy targets for those who would turn them into proxies working on behalf of the copyright industries, cultural policy, efforts to block adult content, and as part of the machinery of law enforcement and national security (see here, here, here, here, here and here). The extent to which Google’s position at the centre of the internet has been leveraged by copyright interests and governments around the world to disable links to materials claimed to be infringing copyright, remove content, and to disclose information about its users is astounding, as its Transparency Report reveals. Indeed, such requests have soared in recent years. set de facto corporate policy norms governing the collection, retention and disclosure of personal information to commercial and government third parties. Whilst we must adjust our analysis to new realities, long-standing concerns also remain alive. Consider, for example, the fact that in the 2011 Canadian federal election every newspaper, except the Toronto Star, that editorially endorsed a candidate for Prime Minister touted Harper. In other words, 95% of editorial opinion expressed plunked for Steven Harper – roughly three times his standing in opinion polls at the time and the results of the prior election. In the 2015 election, similar patterns emerged. Of the ninety-nine paid daily newspapers in Canada, twenty-three marshaled the energy to publish an editorial at all. Of those, seventeen newspapers representing 71% of the editorial opinion expressed lined up behind the ruling Conservatives. The owners of the Postmedia Group, for example, directed the ten dailies that comprise its national chain of papers, and the six major Sun dailies in London, Toronto, Ottawa, Winnipeg, Calgary and Edmonton that it acquired earlier in 2015, to publish an editorial endorsement of Steven Harper for Prime Minister against the opposition of some of the chain’s journalists and editors (55% of expressed editorial opinion). The Globe and Mail took the peculiar stance of endorsing the Conservatives but not Harper (15.6% of expressed editorial opinion). The wall of support was not as complete on this occasion, however. Torstar’s Toronto Star, Hamilton Spectator and Guelph Mercury (21% of expressed editorial opinion), for example, endorsed the Liberals, as did La Presse (Power Corp) (8% of expressed editorial opinion) and the Charlottetown Guardian (Transcontinental) (1% of expressed editorial opinion). No major daily endorsed the NDP, while Le Devoir cast its lot with the Bloc Québécois (representing 2% of expressed editorial opinion) (for a fuller treatment of this issue, see here). As this discussion suggests, ultimately, talk about media concentration is a proxy for larger conversations about the shape of the mediated technological environments through which we communicate, consumer choice, freedom of the press, citizens’ communication rights and democracy. Of course, such discussions must adapt to new realities, but the advent of digital media does not render them irrelevant. In fact, it may make them more relevant than ever (Baker, 2007; Noam, 2009; Peters, 1999). Methodology: How Do We Know Whether Media Concentration is Getting Better or Worse? Measuring media concentration begins by setting out the media industries to be studied, as done at the outset of this post. Revenue data for each of these sectors, and for each of the firms within them with over a one percent market share, is then collected and analyzed. This handy dandy list of sources and others listed here were used. Each media sector is analyzed on its own and then grouped into three categories, before scaffolding upwards to get a birds-eye view of the entire network media ecology: (1) platform media; (2) content media: (3) online media. Results are analyzed from 1984 to 2015, with an eye to capturing changes over time. Lastly, two common tools — Concentration Ratios (CR) and the Herfindhahl – Hirschman Index (HHI) – are used to depict concentration levels and trends within each sector and across the network media ecology as a whole. The CR method adds the shares of each firm in a market and makes judgments based on widely accepted standards, with four firms (CR4) having more than 50 percent market share and 8 firms (CR8) more than 75 percent considered to be indicators of media concentration (see Albarran, p. 48). The Competition Bureau uses a more relaxed standard, with a CR4 of 65% or more possibly leading to a deal being reviewed to see if it “would likely . . . lessen competition substantially” (p. 19, fn 31). At first blush, these higher thresholds seem to dilute the earlier standards that had been set back in 1992. While this may be true, the new guidelines can also be seen as being even more sensitive to reality and tougher than the ones they supersede. This is because they give more emphasis to the degree of change in market power when ownership changes take place. For instance, “mergers resulting in highly concentrated markets that involve an increase in the HHI of more than 200 points will be presumed to be likely to enhance market power”, observes the DOJ (emphasis added, p. 19). Second, markets are defined more precisely based on geography and the details of the good or service at hand versus loose amalgamations of things based on superficial similarities. This is critical. It distinguishes those who would define the media universe so broadly as to put photocopiers and chip makers alongside ISPs, newspapers, film and TV and call the whole thing “the media” (e.g. Skorup & Theirer; Compaine). In contrast, the scaffolding approach we use analyzes each sector before moving to higher levels of generality until reaching a birds-eye perspective on the network media as a whole. Third, the new guidelines turn a circumspect eye on claims that enhanced market power will be good for consumers and citizens because they will benefit from the increased efficiencies that result. What is good for companies is not necessarily good for the country (see Stucke & Grunes, 2012; Mazzucato, 2014). Lastly, the new guidelines are emphatic that decisions turn on “what will likely happen . . . and that certainty about anticompetitive effect is seldom possible and not required for a merger to be illegal” (p. 1). In practice this means the goal is to nip potential problems in the bud before they happen. It also means that experience, the best available evidence, contemporary and historical analogies as well as reasonable economic theories form the basis of judgment, not deference to impossible (and implacable) demands for infallible proof (p. 1). These assumptions overturn three decades of Chicago School economic orthodoxy and its grip on thinking about market concentration (see Stucke & Grunes, 2012; Stucke & Grunes, 2016; Posner, 2011). Freed from such orthodoxy, and the subordination of policy and politics to conservative economists, think tanks and judges, the new guidelines set a tough hurdle for those with the urge to merge. It was such thinking that killed the bid by AT&T – the second largest mobile wireless company in the US – to acquire T-Mobile, the fourth largest, in 2011, for instance (also Stucke & Grunes, 2012). Similar concerns also loom at present as AT&T prepares a takeover bid for Time Warner. This toughening up of the stance on concentration issues had largely passed Canadian regulators by but that has been changing in the past few years. The CRTC’s 2008 Diversity of Voices policy, for instance, created thresholds for a broadly defined TV market whereby a proposed deal that results in a single owner having less than 35% of the total TV market will be given the green light; those that fall in the 35-45% range might be reviewed; and anything over 45% will be rejected (para 87). The CRTC’s threshold is based on a single snapshot of a single company’s share of one broadly defined market – the total TV market –“before” and “after” a single transaction. It is a static measure that has no sense of trends over time or capacity to analyze the drift of events across media and the network media ecology as a whole. Not surprisingly, the Diversity of Voices policy has done nothing to stop the tide toward consolidation within the broadcasting industries let alone between them and the telecommunications industries, as the evidence below demonstrates. In contrast to the CRTC, the Competition Bureau at least does draw selectively from the US HHI guidelines. While it does not use the HHI thresholds, it does focus on “the relative change in concentration before and after a merger” (emphasis added, p. 19, fn 31). the mandated wholesale wireline decision that extends regulated wholesale access to the incumbent telecom and cable companies’ fibre-to-the-premise networks to help encourage competition in the retail broadband internet market while ensuring that rivals such as TekSavvy, Distributel, Primus and others can still compete as technology shifts from copper and coaxial-based networks to fibre-based facilities – all of which the incumbent telecoms and cable companies have fought tooth-and-nail, and which Bell has appealed to the Liberal Cabinet to overturn. Several fundamental principles underpin these decisions. A key point is the CRTC’s recognition that the “incumbent carriers continu[e] to dominate the retail Internet access services market” (CRTC, 2015-326, para 125). The wholesale mobile wireless decision arrives at the same conclusion (CRTC, 2015-177, paras 35, 72-74, 86-88). Moreover, there is “limited rivalrous behaviour” between the incumbents (CRTC, 2015-326, para 123). Lastly, whatever “competition that does exist today is largely, if not entirely, a result of regulatory intervention”, states the Commission (CRTC, 2015-326, para 123). The upshot of this recent turn of events is two-fold: first, questions of market concentration and market power are not just conjecture but legal findings of fact. Second, in the face of such realities, the regulator has stiffened its spine and acted in a manner that marks a clear break from the “regulatory hesitation” that has defined so much of the regulatory culture in Canada in the past (Berkman, 2010, p. 163). Whether this will continue to be the case is a crucial issue. However, history and international experience teaches that in the face of intransigent opposition from incumbents, only governments and regulators with a stiff spine and strong political will succeed in fostering more competition and improved developments in the communications and media fields (see, for example, Noam, 2013; Mazzucato, 2014; OECD, 2013, p. 23; Ofcom, 2012, pp. 67-68; Ofcom, 2012; Stucke & Grunes, 2012; Stucke & Grunes, 2016; US, DoJ, 2011; Berkman, 2010, pp. 162-168). While this regulatory turnaround is new, a keen interest in media concentration is not. As a matter of fact, there has long been a keen interest in the subject in Canada and the world over since the late-19th and early-20th centuries, even if it such interest ebbs and wanes over time. In 1910, for example, early concerns with vertical integration were registered when the Board of Railway Commissioners (BRC) – the distant cousin of today’s CRTC — broke up a three-way alliance between the countries’ two biggest telegraph companies — the Canadian Pacific Telegraph Company and the Great Northwestern Telegraph Co. (the latter a division of the New York-based goliath, Western Union) – and the American-based Associated Press news wire service. Why? It did this for much the same reasons that the CRTC chose to do as it did in the Mobile TV decision discussed a moment ago. That is, because carriers should not be editors who use their control over the wires (or spectrum) to decide who gets to speak to whom on what terms. In this historical case, and in the face of much corporate bluster, the regulator was emphatic that while allowing the dominant telegraph companies to give away the AP news service for free to the leading newspaper in one city after another across Canada might be a good way for the companies to attract subscribers to their vastly more lucrative telegraph business it would effectively “put out of business every news-gathering agency that dared to enter the field of competition with them” (1910, p. 275). In a conscious effort to use telecommunications (railway) regulation to foster competing news agencies and newspapers, Canada’s first regulator, the BRC, forced Western Union and CP Telegraphs to unbundle the AP news wire service from their telegraph service. It was a huge victory for the Winnipeg-based Western Associated Press that pressed the case, and other ‘new entrants’ into the newspaper business as well. It was also the decisive moment when the principle of common carriage born in Canada (Babe, 1990). Throughout the 20th century similar questions arose and were dealt with as the situation demanded. One guiding rule of thumb of communications policy, however, was that of the “separations principle”, whereby telecoms carriers – usually two of them, e.g. telegraph vs telcos in the early 1880s, the TransCanada Telephone System (TCTS) and CNCP for three-quarters of the 20th century, the telcos vs cablecos ever since, and the telcos’ consortium Stentor versus Rogers/Cantel in the early days of mobile wireless from 1985 until the mid-1990s — competed to carry messages from all types of users, and for all types of purposes – business, personal, governmental and broadcasting – but were prevented by law from directly creating, owning or controlling the messages that flowed across the transmission paths they owned and controlled. A general concern also hung in the air in government, business, broadcasting and reformist circles that those who made communications equipment, or operated transmission networks, should not operate broadcast stations, make movies or publish newspapers, books, software, etc. That this was so could be seen, for example, when the original equipment manufacturing consortia behind the British Broadcasting Company in the UK and the National Broadcasting Company / Radio Corporation of America in the US, respectively, were ousted from the field in the 1920s during the remaking of these entities into the stand-alone broadcasters that they eventually became. Nor should telephone companies such as AT&T play an active role in the film industry, as was the case when, after having wired movie theatres across the US and the Hollywood production studios for sound, circa 1927ff, AT&T took on a larger role by financing and vetting films during the 1930s (see Briggs, 1995; Barnouw, 1966; Danelian, 1939). The consolidation of broadcasting under the CBC in the 1930s brought private broadcasters into the core of the Canadian ‘broadcasting system’ from the get-go. The creation of the CBC also wiped out important local, foreign and educational voices, and even a small theatrical radio club in Winnipeg who were taking live theatre from the state to the airwaves. In each case, it was the structure and organization of the communication / media system, and who owned what and in what proportions, that decided who got to talk to whom on what terms. The separation of transmission and carriage from message creation and control was another principle that was worked out in a myriad of different ways. Aside from keeping the telegraph companies out of the news business, and telephone companies out of broadcasting and the movie business, most of the time such issues were considered tedious, boring, and tucked away in obscurity in parliamentary papers, legislation and corporate charters. Bell’s charter, for instance, prohibited it from entering into ‘content and information publishing services’, from radio to cable TV and ‘electronic publishing’, until the early 1980s, when more and more exceptions to the general rule were adopted. The same was true for other telcos, private and public, across the country, even though Manitoba and Saskatchewan began to lay fibre rings in a few key provincial cities and offer modest cable TV services in the 1970s (Babe, 1990; Winseck, 1998). Media concentration issues also came to a head in the 1970s, for example, and again at the beginning of the 1980s, when three inquiries were held: (1) the Special Senate Committee on Mass Media, The Uncertain Mirror (2 vols. )(Canada, 1970); (2) the Royal Commission on Corporate Concentration (1978); and (3) the Royal Commission on Newspapers (Canada, 1981). While these proceedings did not mount to much, they left a valuable historical and public record. Things lay dormant for more than two decades before springing to life again after a wave of consolidation in the late-1990s and at the turn-of-the-21st century thrust concerns with media concentration back into the spotlight. Three inquiries between 2003 and 2008 were held as a result: (1) the Standing Committee on Canadian Heritage, Our Cultural Sovereignty (2003); (2) the Standing Senate Committee on Transport and Communications, Final Report on the Canadian News Media (2006); (3) the CRTC’s Diversity of Voices report in 2008. Things have not let up since. Indeed, they have been on a high boil in recent years, with a non-stop series of reviews at the CRTC that will go a long way to shaping the emergent internet-centric media ecology for decades, including, for instance: (1) Bell’s take-over of Astral Media, (2) the regulated wholesale access decisions affecting both the mobile wireless and wireline telecoms markets, respectively, (3) the Mobile TV decision, (4) a series of cases now underway (or recently concluded) that test the extent to which vertically-integrated telecom-media giants such as Rogers, Bell and Videotron’s can leverage their control over networks to influence the content made available over those networks (see, for example, Videotron’s Music Unlimited case or the Rogers GamePlus and Hybrid Video-on-Demand decisions), and (5) the CRTC’s examination of “differential pricing practices,” that is, the use of content- or application-specific discriminatory pricing by mobile carriers and other ISPs. All of this is taking place, as I noted in the last report, within an ever more internet- and mobile-centric media economy that has grown immensely from $19.4 billion in 1984 to $77.8 billion last year. The early years of that period (the decade between 1984 and 1996), was characterized by the emergence of new players across the media landscape and the growth of broadcast as well as pay and subscription television channels. In terms of ownership, existing players and a few newcomers, such as Allarcom and Netstar, cultivated the field. During this period, television and radio broadcasters were often owned by companies whose interests lay in other, unallied areas, such as real estate, as with the BC TV and radio group Okanagan Skeena, or Molson’s Brewery, one of the founders of Netstar early in that entity’s history. These companies share of the market grew steadily until they were taken over by the larger players of their time, however, the generation direction of events was towards more players and, thus, toward more diversity in television ownership. When consolidation did take place in the 1980s and 1990s it was mostly among individual players in single media markets. Conrad Black’s take-over of Southam newspapers in 1996 symbolized the times as did the amalgamation of local and regional television ownership groups at the end of the 1990s to create several national commercial television networks under common ownership: CTV, Global, TVA, CHUM, TQS. While weighty in their own right, these amalgamations did not have a big impact across the media. The CBC remained prominent, but public television was being eclipsed by commercial television as the CBC’s share of all resources in the television ‘system’ slid from 44 percent in 1984 to less than half that amount today (19.6%). Media conglomerates were not unknown (Maclean-Hunter was a good example), but they were not the norm. Bell was a diversified communications colossus, to be sure, but it was not in the media business proper, and was prevented by its charter and by law from being so. 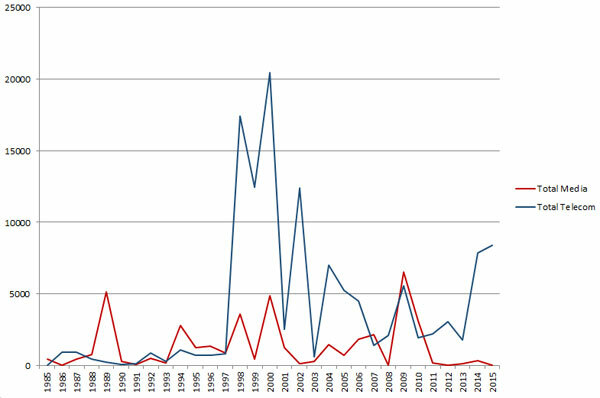 In contrast to broadcasting any most other content media industries, concentration levels remained sky high in wired line telecoms, while new mobile wireless telecoms services were developed by two sets of competing firms: between 1983-1984, Rogers-Cantel was licensed by the Department of Communication to offer national wireless service, while 11 incumbent telephone companies (e.g. Bell Canada, Telus, MTS, Sastel) received licenses to provide competing services in their respective operating territories (Klass, 2015, pp. 58-61). Gradual policy reforms characterized the 1980s and early-1990s, before a more concerted shift took place with the introduction of long distance competition in 1992, two new national competitors in wireless in 1995 (Clearnet and Microcell) and local telephone competition in 1997. The Chretien Liberals also gave the green light for the telephone and cable companies to compete in one another’s respective areas of dominance in 1996. Concentration rates fell across the board, except in cable television distribution. In general, telecoms competition moved slowly from the ends of the network into services and then deeper into the network infrastructure, as it had done in one country after another around the world, aided and abetted by strong government interventions that used interconnection and network unbundling rules, access to spectrum, wholesale pricing regulation, and market liberalization to actively spur on competition. Competition gained traction in the 1990s as a result but the trend was thrown into reverse by the dot.com crash in late-2000. Wave 1: 1994 to 2004: Rogers’ acquisition of Maclean-Hunter (1994), but peaking from 1998 to 2001: (1) BCE acquires CTV and the Globe & Mail ($2.3b); (2) Quebecor takes over Videotron, TVA and the Sun newspaper chain ($ 7.4b) (1997-2000); (3) Canwest buys Global TV ($800m) and Hollinger newspapers papers, including National Post ($3.2b); (4) Telus acquires Clearnet ($6.6B, the largest acquisition in Canadian telecommunications history at the time) (2000). Wave 2: 2004-2007: Rogers acquires Microcell ($1.4B) (2004). Bell Globemedia re-branded CTVglobemedia; BCE exits media business. CTVglobemedia acquires CHUM (Much Music, City TV channels and A-Channel). CRTC requires CTVglobemedia to sell City TV stations – acquired by Rogers (2007). Astral Media’s buys Standard Broadcasting. Quebecor acquires Osprey Media (mid-size newspaper chain)(2006). Canwest, with Goldman Sachs, buys Alliance Atlantis (2007) (Showcase, HGTV, BBC Canada and biggest film distributor in Canada). Wave 3: 2010 – 2015: Canwest goes bankrupt (2009-2010), its newspapers acquired by Postmedia and TV assets by Shaw. BCE makes a comeback, buys CTV (2011) and bids for Astral Media in 2012, but fails to gain CRTC approval, before gaining the regulator’s blessing in 2013. Bell sells Teletoon (TELETOON Retro, TELETOON Retro, TELETOON / TELETOON and the Cartoon Network), Historia and Séries+ to Corus (Shaw), the Family Channel, Disney Jr. and Disney XD to DHX media, and MusiquePlus and MusiMax to V Media, as well as ten radio stations to Newcap (5), Pattison (3) and Corus (Shaw)(2) – as the Competition Bureau and CRTC required as a condition of approval of Bell’s take-over of Astral media in 2013; Telus acquires Public Mobile (2013); Rogers acquires Mobilicity ($465M)(2015); Postmedia acquires Quebecor’s English-language papers (e.g. including the six Sun dailies, 27 small dailies and 140 community weeklies) (2015) (also see Competition Bureau approval), and Shaw acquires Wind (early 2016). The massive wave of capital investment that drove consolidation across the telecom, media and Internet industries during these different phases is illustrated in Figure 1 below. Sources: Thomson Reuters. Dataset on file with author. Mergers and acquisitions rose between 1994-1996, spiked to unprecedented levels by 2000, and then collapsed when the bursting of the dot.com bubble brought things crashing to a halt. Consolidation regained steam between 2004 and 2007, then plunged with the onset of the Global Financial Crisis (2007ff), before rising significantly in four of the past six years. Again, trends in the network media economy swiveled on those evident in the economy at large. Consolidation in the telecoms industry has been low for the past half-decade but a significant uptick has taken place since Telus bought Public Mobile in 2013, Bell acquired the stake in Bell Aliant that it did not already own at the end of 2014 and is now in the process of taking over MTS, pending regulatory approvals (See here for our report on the proposed merger), and Rogers acquired (and then dismantled) Mobilicity in 2015. On the media side, however, as Figure 1 illustrated, things have surged in recent years. Shaw’s take-over of Global TV in 2010, with its suite of thirty specialty and pay TV channels and nine television stations, from Canwest (2010) as well as Bell’s re-purchase of CTV (2011) and take-over of Astral two year’s ago, respectively were responsible for the trend (includes joint ownership stake in Maple Leaf Sports and Entertainment) (see Pay & Specialty Channel List, sheet 2; BCE, Annual Report, p. 29). The latter set of deals transformed Bell into the biggest TV and radio broadcaster in the country, with a suite of thirty-one broadcast TV stations, forty-four specialty and pay TV channels, and 106 radio stations in fifty-four cities nationwide. Consolidation in the TV industry has been the result. More importantly, though, consolidation has yielded a specific type of media company that now sits at the apex of the network media universe in Canada: i.e. the vertically-integrated telecoms, internet and media conglomerate. Vertical integration has soared and is now very high relative to the past and to conditions in the United States and internationally. Figures 2 and 3, below, illustrate the steep increase in vertical integration occurred between 2008 and 2015 (although having reached their high water mark two years earlier). Sources: see the “Top 20 w Telecoms” sheet in the CMCRP Workbook. As Figures 2 and 3 illustrate, in the span of six years, the share of overall network media economy revenue held by vertically-integrated entities in Canada more than doubled. By 2015, four giant vertically-integrated TMI conglomerates accounted for 55.7% of all revenue across the whole of the network media economy: Bell (CTV), Rogers (CityTV), Shaw (Global) and QMI (TVA), as Figure 3 shows. These developments are important for several reasons. First, they distinguish the past from the present. Centre stage is currently occupied by a handful of vertically-integrated telecoms, internet and media giants with a reach across the network media ecology, or five if we include Telus on account of its fast growing role in television distribution. 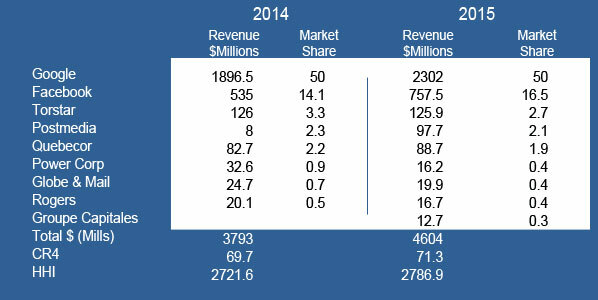 Zero in on just telecoms and broadcasting, and the ‘big 5’ accounted for roughly two-thirds of all revenue in 2010. By 2015, that figure had soared to 84%. Second, these five companies’ control over communications infrastructure (content delivery) is the fulcrum of their business. Their stakes in content media, while extensive, are modest; Telus is not in the content business at all beyond buying rights for its Optik IPTV and mobile TV services. For Quebecor, Shaw, Bell and Rogers, 70-90% percent of their revenues flows from their control over bandwidth and connectivity rather than from content creation and exhibition. Figure 4 below illustrates the point. Content media have largely become but ornaments on the carriers’ organizational structures. They are strategically important but subordinate to the fact that their real purpose seems to be to drive the take-up of the companies’ wireless, broadband internet, and cable, satellite and IPTV services. The fact that nearly half (e.g. 40%) of the roster of Bell’s Mobile TV service, for example, is filled with channels it owns illustrates the point: CTV, CTV News Channel, CTV Two, Business News Network, Comedy Network, Comedy Time, MTV, NBA TV, NHL Centre Ice, E!, RDS, RDS2 and TSN, TSN2. The CRTC has already determined in the Mobile TV case that Bell was using its control over the means of delivering television programming to confer an undue preference on its services at the expense of subscribers, rivals and independent sources of content available over the internet. Bell was quick to appeal that ruling to the Federal Court of Appeal, demonstrating the lengths to which the vertically integrated companies are willing to go to protect their ability to offer services as they please, although the appeal was rejected in mid-2016. Other cases like Mobile TV, however, are emerging one after another in what appears to be a never ending game of regulatory whack-a-mole: see, for example, the complaint initiated by J. F. Mezei and the Public Interest Advocacy Centre against Videotron’s Music Unlimited, which has been rolled into a broad review of “differential pricing practices” now before the CRTC, or the Commission’s Hybrid Video-on-Demand decision,, or the Commission’s Hybrid Video-on-Demand decision, or Bell’s appeal of the wholesale vertical integration code, to name just a few. The thread connecting them all is the extent to which content is being tied to carriage in ways that raise crucial questions about the future of common carriage (“network neutrality”) and ‘the open internet’. These cases are the crux over which the “battle over the institutional ecology of the digital environment” is being waged, as Yochai Benkler once put it (pp. 383-460). Vertical integration is not just high by historical standards in Canada, it is high relative to the United States and by international standards. Figure 5 below illustrates the point with respect to the United States. Sources: see the “Top US Telecom + Mediacos” sheet in the CMCRP Workbook. Despite the obvious difference indicated in Figures 3 and 5, the contrast is even greater because the latter figure overstates the extent of the trend in the US by counting AT&T and Charter as vertically-integrated companies when in fact, the extent of their ownership of TV content services are negligible. This is true even after taking account of the fact that AT&T became the biggest BDU in the US last year after acquiring DirecTV. Other than a handful of regional sports networks, AT&T’s ownership in TV services and content is tiny. Charter’s just approved take-over of Time Warner Cable and Bright House does not change this fact. Ditto for Verizon, whose TV service holdings are miniscule. If we took AT&T out of the picture for this reasons and substituted Cox, the next biggest vertically integrated firm, the top four such firms in the US would account for 20% of all revenue – roughly a third the rate in Canada. Figure 6 below uses the most recent data available for the twenty-eight countries covered by the International Media Concentration Research Project (2009) and for Canada for the years covered by that project and 2013 in order to account for Shaw’s acquisition of Global TV in 2010 as well as Bell’s acquisition of CTV and Astral Media in 2011 and 2013, respectively. It does so to illuminate the extent of vertical integration in Canada relative to international standards. Sources: see the “CrossOwnership Canada vs World” sheet in the CMCRP Workbook and International Media Concentration Research Project. Figure 5 reveals several interesting points. For one, it shows that Canada has long been closer to the high end of the scale when it comes to vertical integration and cross media ownership than to the low end. It ranked 19th out of 28 in 2004. 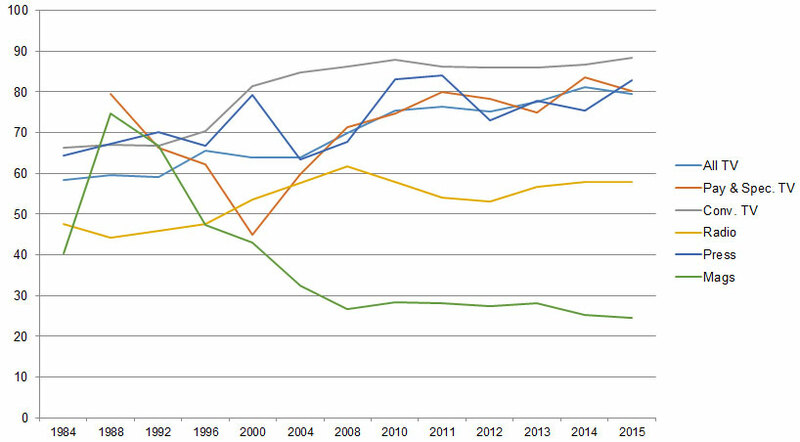 By 2009, however, it had moved much closer to the top of the scale, with the third highest levels of vertical integration, after Finland and Sweden. In 2013, and after Shaw and BCE acquired Global TV, CTV and Astral Media, respectively, Canada had the highest levels of vertical integration and cross-media ownership out of the 28 countries studied. While it is possible that similar processes took place in other countries after 2009, I am unaware of similar processes of such magnitude anywhere else. There has been a significant increase in vertical integration in the United States on account of Comcast’s acquisition of NBCUniversal in 2011, and last year’s acquisition of DirecTV by AT&T. that number will grow higher yet should AT&T’s proposed take-over of Time Warner be approved, but even after these transactions are accounted for, conditions in the US fall well short of what they are in Canada. Moreover, in most countries, the trend over the time period examined was in the opposite direction. Indeed, as scholars from across the political spectrum have chronicled, while popular within the industry and amongst the mergers and acquisition crowd in the late-1990s, the tide toward vertical integration has turned since the early-2000s. Since then, media conglomerates have been dismantled or failed outright (e.g. AOL Time Warner, AT&T, Vivendi, Adelphia, CBS-Viacom, News Corp, etc). Cast in this longer and broader context, Comcast’s acquisition of NBCUniversal in 2011 and AT&T’s take-over of DirecTV in 2015 in the US are exceptions to the general rule (Picard, 2011; Jin, 2013; Skorup & Thierer, 2012; Thierer & Eskelen, 2008; Waterman & Choi, 2010). The main trend, as Dal Yong Jin observes, since the mid-2000s has been toward vertical dis-integration and de-convergence. ‘online media’ (search, social media, online news sources, desktop and mobile browsers as well as desktop and smart phone operating systems). At the end, I combine these again one last time to complete the analysis and gain a bird’s eye view of the network media industries as whole. All sectors of the platform media industries are highly concentrated or at the high-end of the moderately concentrated scale, although Internet Access continues to be a partial exception. This has long been the case, although with important exceptions, past and present. Sources: see the “CR & HHI” sheet in the CMCRP Workbook + individual sheets for each sector. CR4 and HHI measures for wireline telecoms scores fell in the late-1990s as competition gained traction, sped along by the introduction of long distance competition in 1992 and local telephone competition five years after that. Concentration in this sector reached its lowest levels ever between 2000 and 2004 as a result before the effects of the dot.com bubble collapse wiped out many of the new rivals with it (CRTC, 2002, p. 21). Competition waned thereafter until 2008, but has risen since. Concentration levels fell significantly last year – indeed to their lowest level in the period covered by this report — on account of MTS’s sale of Allstream to the US backbone network operator, Zayo. That said, however, it still remains that the level of concentration in the wireline market remains very high by both the CR4 and HHI measures. In recent years, a number of studies have argued “that there is not a competition problem in mobile wireless services in Canada” (see here, here, here). They also claim that, relative to international standards, concentration levels in mobile wireless services in Canada are at the low end of the range, and have fallen in recent years. The Canadian market is actually competitive and becoming more so, they claim. In 2008, the Conservative government began to use spectrum policy and a series of new rules to more aggressively encourage new entrants to enter the market. Following the 2008 auction of “advanced wireless services” (AWS) spectrum, in which Industry Canada reserved spectrum exclusively for new firms, four “new entrants” joined the field: Wind, Videotron (Quebecor), Public Mobile and Mobilicity. Eastlink, a subsidiary of diversified conglomerate Bragg, won spectrum in the 2008 auction, technically making it a fifth “new entrant,” but for reasons unknown it waited until 2013 to launch service in its home territories in the Maritimes. As a result of these efforts, levels of concentration in the mobile wireless section have come down, although they still remain firmly within the highly concentrated territory. The top three mobile network operators – e.g. Rogers, Telus and Bell – had a market share of 91% in 2015, down appreciabley from 96% when the previous government began its crusade to introduce a fourth wireless competitor in all areas of the country. Indeed, at least two of the new entrant mobile network operators have carved out a measure of success for themselves during this period as pro-competitive policy measures put into place by the previous government gained traction: Wind, and Vidéotron. In what follows, we present an analysis of recent developments in the mobile wireless market, to better understand these high level trends. The initial years were rocky for most of the new entrants. A challenge to Wind’s ownership was mounted by the CRTC in 2008/9 upon petition by Shaw and Telus; the Commission determined that Wind did not meet the foreign ownership criteria, creating uncertainty for the company’s future (Klass, 2015, pp. 74-76). The CRTC’s decision was overturned by the Conservative Cabinet in 2009, with the net effect being a major delay for the young wireless competitor. While this decision was also challenged, the issue became moot with a change to the legislated foreign ownership restrictions in 2012, which amounted to another prong in the Conservatives’ campaign to increase the competitiveness of telecommunications markets across the land. By the end of 2015, Wind had around 940,000 subscribers, a figure which was revealed when Shaw announced plans to acquire the “new entrant” provider. The transaction was completed in the first quarter of 2016, a development which marks a qualitative shift in the wireless market with what we believe are some very important implications. Other new entrants have not fared well. Public Mobile failed in 2013, and was acquired by Telus. Similarly, Mobilicity was acquired by Rogers in 2015 following nearly two years spent under creditor protection, and Rogers is presently in the early stages of phasing out the brand, moving its subscribers over to its Chatr flanker brand. Videotron, by contrast, appears to have fared quite well; by year end 2015, it had approximately 768,000 mobile subscribers in its operating territory of Québec and the National Capital Region. It has also struck network sharing agreements with Rogers in Québec, and in 2014 it purchased licenses for the desirable 700MHz spectrum in BC, Alberta, and Ontario, fuelling speculation that the company was preparing for a national expansion. Although Videotron has since announced that it has no such plans, its market share within Québec continues to rise, suggesting that it has found a viable space in the wireless business. By the end of 2015, the combined national marketshare of the remaining new entrants had crept upward to just under 4%, compared to 3.1% a year earlier. Include MTS and SaskTel in the group and, combined, the new entrants and smaller regional incumbents accounted for nearly 8% of wireless revenues according to both the CRTC and the CMCR Project’s data (see “Wireless” sheet in the CMCRP Workbook and CRTC, 2016 CMR, Figures 5.5.6). While the data reflect the success of Wind and Vidéotron, one detail that must not be missed is the fact that both (after Shaw’s acquisition of Wind) are now part of large communications conglomerates, so the extent to which they can truly be considered “new entrants” is debatable. Zoom out from a single focus on the wireless market, and we see that all wireless carriers are now part of diagonally integrated communications companies. Diagonal integration refers to a situation in which firms operate across distinct spheres of related markets (i.e. wireline and wireless broadband). This has important implications for understanding how firms offer services; for instance, as we have documented elsewhere, stand-alone mobile providers tend to offer more generous data buckets than mobile providers that are connected to wireline network operators. In short, expectations of disruptive behaviour from Wind and Vidéotron should be tempered in consideration of the fact that they both now operate as part of larger firms with often competing interests across the network media economy. While the incumbents’ market share dropped appreciably between 2008 and 2013, it has remained virtually unchanged in the last two years. Rogers (32.4%), Telus (29.6%) and Bell (29.1%) accounted for 91.2% of the market by revenue at the end of 2015, or 90% when measured by the number of subscribers (see the “Wireless” sheet in the CMCRP Workbook and CRTC, 2016 CMR, Figures 5.5.5 & 5.5.6). The HHI score for mobile wireless in 2015 reflected the small gains made by smaller players, dropping to 2792 from 2856 in the previous year, a slight improvement, to be sure, but still far above the 2500 threshold that marks a highly concentrated market (see “Wireless” sheet in the CMCRP Workbook). Moreover, national measures of concentration understate conditions in specific provinces, regions and cities, while overstating conditions in others. The least concentrated market in Canada is in Quebec, where Bell (31.9% share of revenues), Rogers, (28.8%), Telus (28.8%) face challenge not only between themselves but from Videotron as well. Videotron’s share of the Quebec market grew to 10.5% of revenues last year according to the CMCRP’s data, and 13% of subscribers according to the CRTC. Compared to Ontario, Alberta, and BC, the competitive scene in Quebec appears to have resulted in price relief for certain service tiers — between 15 and 30% for high-usage plans, according to providers’ online sites — although it is worth noting that entry-level tiers across the provinces just mentioned remain similarly priced. Eastlink launched its own mobile wireless service in the Maritime Provinces in 2013, and expanded to a handful of towns and cities in Northern Ontario during summer 2016, but it is still too early to see the results — an outcome made all the more difficult by the company’s tight-fisted approach to the public release of information. In Quebec, the top two wireless companies had a combined subscriber market share of 59% — the lowest in the country by a large margin. The figures were in the 77-79% range in Alberta, Ontario and British Columbia in contrast, and much higher yet in Saskatchewan (81%), New Brunswick (83%), Manitoba (85%), Nova Scotia (87%), PEI (88%) and finally Newfoundland, Labrador and the Far North (99%) (CRTC, 2016). These figures, however, do not reflect the impact of Wind, which for unknown reasons has been excluded from the CRTC’s public data on province-level subscriber marketshare (CRTC CMR 2016, Table 5.5.8). In a nutshell, at the provincial level the data show that there tends to be one or two firms in a dominant position, with a third and/or fourth runner up trailing far behind. In other words, the geography of competition is limited. That being said, communications markets do not always neatly conform to economic metrics. An example of this can be found by examining the mobile wireless markets in Manitoba and Saskatchewan. Each of those provinces’ wireless markets are dominated by the incumbent local exchange carriers (ILECs), MTS and Sasktel, who controlled 49% and 66% of total subscribers in their respective territories at the end of 2015. Although Sasktel and MTS are the two most dominant wireless providers by provincial market share, the competitive situation in the prairies evinces lower prices and a greater degree of choice amongst service offerings than found elsewhere in Canada, not just from the ILECs but from the competing national carriers as well. For instance, both Sasktel and MTS offer mobile plans that include unlimited voice calling and unlimited mobile broadband usage on their province-wide networks, whereas ‘unlimited data’ is not to be found elsewhere in Canada, save within Wind Mobile’s footprint, which is largely limited to urban areas and still does not feature LTE speeds. Additionally, the national carriers have responded by offering prairie customers plans that feature much larger data buckets than those available at similar price points in other provinces (i.e. deep discounts), as Peter Nowak recently observed. Although CR4 scores are broadly similar across provinces, and HHI scores all fall within the “highly concentrated” range, competitive dynamics nevertheless differ from place to place, and understanding the facts behind the figures often benefits from this kind of analysis. These difference may be coming to an end, however, as Bell announced its intentions in May 2016 to take over MTS, a move which would likely result in reduced competition not just in Manitoba, but potentially in Saskatchewan as well: should the deal be approved, Sasktel may be next on the chopping block, as some are speculating. The deal is not done yet, though, as at time of writing the merger (and the increase in concentration it represents) still awaits judgment from regulatory authorities at the Competition Bureau, ISED, and the CRTC. The limits to competition are also illustrated by the fact that two of the new entrants have failed: Public Mobile and Mobilicity. Public Mobile was acquired by Telus in 2013 and shut-down the next year. Mobilicity was taken over by Rogers last year and then dismantled in a complex series of spectrum exchanges, much to Wind’s — and ultimately Shaw’s — benefit, which picked up additional spectrum at set-aside prices in Manitoba before selling it on to MTS. The demise of Public Mobile and Mobilicity have largely redounded to the benefit of Wind and Videotron, which together saw their share of the ‘national mobile wireless market’ rise to 4%. Whatever gains have been had in the past few years are still far off the high-water mark of the late 1990s when two new rivals, Clearnet and Microcell, garnered 13% of the market between themselves before being taken over by Telus and Rogers in 2000 and 2004, respectively. Plus ça change, plus c’est la meme chose, as Daniel Paré has observed. “there is no rivalrous behaviour between the national wireless carriers in the provision of GSM-based wholesale MVNO access at a national level” (para 86). The CRTC’s Wireless Framework decision highlights another interesting characteristic of the Canadian wireless market: the total lack of mobile virtual network operators, or MVNOs. As demonstrated by the CMCR Project’s 2014 report, Mobile Wireless in Canada: Recognizing the Problems and Approaching Solutions, MVNOs play an important role in wireless markets around the world, both from an economic and from a policy perspective. Regulators around the globe have taken steps to foster open access to wireless networks in order to spur competition from MVNOs. In its decision, the CRTC determined that the national facilities-based wireless carriers had market power over third-party access to their networks, and had denied service to would-be competitors. While it took steps to encourage the entry of MVNOs, it stopped short of mandating access to the national carriers’ networks. In the absence of such a mandate, it is unlikely that third party service providers will emerge to provide market discipline similar to the way companies like Teksavvy, Distributel, and Primus have done under the mandated access regime that applies to Canada’s wired broadband networks. Several challenges were mounted to the CRTC’s decision not to mandate MVNO access to the national carriers’ networks. In August 2015, the Canadian Network Operators’ Consortium, a trade group representing wholesale ISPs, filed an application requesting that the CRTC review and vary its decision, and require national carriers to allow independent MVNO access to their networks. The CRTC subsequently denied that application, although the issue has not been put to rest. In early 2015, Ice Wireless, a small mobile provider serving Northern areas of Canada, began to use its wholesale roaming agreement with Rogers to operate an MVNO called Sugar Mobile throughout Canada. The issue came to the CRTC when Rogers requested to terminate its agreement with Ice. While a decision is still pending on the matter, what is clear is that, as new entrants have failed or been consolidated as in the case of Wind, consumers and competitors continue to look toward MVNOs as a viable and attractive alternative to the concentrated status quo. In sum, no matter how one looks at it, by city, region, province, or country, or by revenue, subscribers, or spectrum held and used, mobile wireless services are highly concentrated. While the prevailing CR and HHI levels in Canada are not especially high by international standards, the more pressing point is that concentration levels in mobile wireless markets around the world are, with few exceptions, “astonishingly high” (Noam, 2013, p. 8). Given this, the real question is what, if anything, will be done about this state of affairs? The CRTC’s recent actions have begun to address that question. As the telecoms and Internet boom gathered steam in the late 1990s new players emerged and become significant competitors. Indeed, by 1996, the incumbent telephone and cable companies’ share of the internet access market was minimal while four relative newcomers accounted for over a third of the market: AOL (12.1%), Istar, (7.2%), Hook-Up (6.3%) and Internet Direct (6.2%). As a general observation, incumbents were slow to arrive and in the meantime new players stepped into the breach to develop internet access in Canada. The early ‘competitive ISP era’ continued up to the turn-of-the-century but subsided thereafter on account of, first, the collapse of the dot.com bubble, when many of the early ISPs went out of business and/or were absorbed by larger players, and second, the switch-over from dial-up to high speed internet access. By 2000, the big four’s (Bell, Shaw, Rogers & Telus) share of the internet access market had grown to 39%, but this was still one of the most competitive sectors of the network media economy at the time. The industry has steadily consolidated around the incumbent telephone and cable companies ever since. 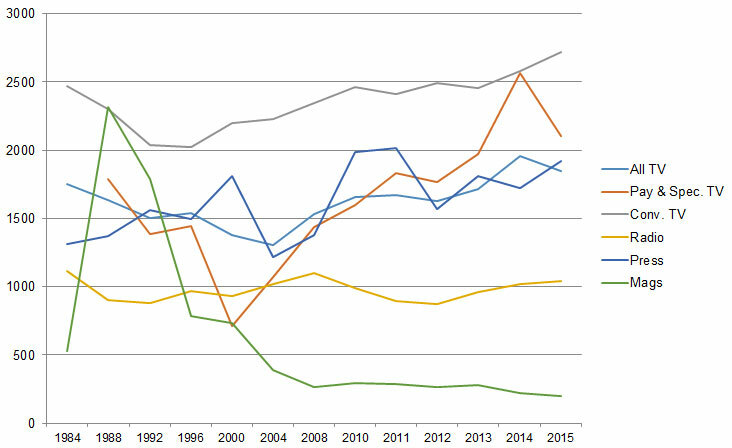 By 2004, the top four firms accounted for roughly half of all revenues. That figure rose steadily over the next decade, to the point where the top four firms have accounted for around 60% of the market. The number in 2015, was 61%. The top five companies – Bell, Rogers, Shaw, Telus and Videotron, in that order – accounted for 71% of all revenues in 2015, by our measure, or 73% of the retail internet access market, according to the CRTC’s figures (p. 246). The HHI score for internet access more than doubled between 2000 and 2015, but it is still low relative to most other sectors covered by this report and for this measure’s standards for concentration. However, this also reflects the limits of this measure. A closer look shows, for example, that 89% of the residential retail internet access market is accounted for by the incumbent telcos and cable companies on the basis of revenue or 88% when measured by the number of subscribers (CRTC CMR, Tables 5.3.2 and 5.3.4). Broaden the measure to include both the wholesale and retail internet access markets, and the incumbent telcos and cable companies accounted for just over four-fifths of the market by revenue: e.g. Bell (22.8%), Rogers (14.5%), Shaw (13.1%), Telus (10.5%), Videotron (10%), Cogeco (4.7%), Eastlink (2.3%), SaskTel (1.8%) and MTS (1.5%) (see “ISP” sheet in the CMCRP Workbook). The two biggest indy ISPs – TekSavvy (257,000 subscribers) and ExplorNet (250,000) – account for 3.1% of revenues, in contrast. In short, when assessed at the local level, rather than on the basis of national HHI scores, the telcos and cable companies’ dominance of local markets across Canada is brought into sharper relief. The upshot is that while the national HHI standard implies a highly competitive market, a closer inspection reveals quite the opposite, with local internet access markets in cities across the country highly concentrated, with exceptions in very densely populated urban areas where wholesalers provide access. According to the CRTC, there are about 500 independent ISPs scattered across the country, and altogether they accounted for 11.3% of retail internet access revenues in 2015. While the indy ISP’s share of the retail internet access market has crawled upwards over the past five years (CRTC CMR, Tables 5.3.2 and 5.3.3), but concentration at the local level continues to be stubbornly high. whatever “competition that does exist today is . . . a result of regulatory intervention” (para 126). This was much the same reasoning that underpinned the Commission’s wholesale mobile wireless decision earlier in the year. In both cases, having found that concentration was not a matter of conjecture but of fact, the regulator decided to act, in the case just discussed to help ensure that whatever minimal competition that does exist today is not washed away tomorrow by the transition to fibre-based internet access. While Bell petitioned that decision, it’s appeal was ultimately rejected by the Liberal Government in May 2016. There is no doubt that competition between cable companies and the telcos has intensified. Prior to the advent of IPTV services in 2004, consolidation in the BDU market had been rising for two decades, with a brief interruption after satellite TV services were introduced in the late 1990s. After declining to a contemporary low in 2000, when the top four BDUs accounted for 75% of the market and the HHI was 1729, concentration levels began to soar. By 2004, the top four BDUs — Shaw, Rogers, Bell and Videotron — accounted for 87% of the market; by last year the number had fallen to 80%. Either way, both figures are well over the 65% market share held by four players that the Competition Bureau uses as part of its merger assessment guidelines. The development of IPTV services has put the brakes on the upward drift of concentration visible a decade ago. At the same time, however, this is a change in degree, not in kind. While many claim that widespread cord cutting is hurting the cable television industry, almost all of the losses to cable and direct-to-home satellite TV providers have redounded to Telus, Sasktel, MTS and Bell’s IPTV services. Revenue for the sector continues to grow at a slow pace. Our previous report covers this issue in some detail. From the time when MTS and SaskTel began to roll out IPTV services in 2004, followed later by Telus and Bell in 2007/2008 and 2009/2010, respectively, the HHI score has dropped significantly. In 2004, the HHI was 2206, last year it was 1855 – a significant drop, to be sure, but still well within the moderately concentrated of the scale (see the “CableSatIPTV” sheet in the CMCRP Workbook). As noted in the last report, by the end of 2015, 17% of Canadian households got their television service from the local telephone company: e.g. Telus, Sasktel, MTS or Bell. These companies’ Internet Protocol TV (IPTV) services grew swiftly to 2,401,416 subscribers with revenues of $1.73 billion last year. By the end of last year, the telcos garnered close to twenty percent of the TV distribution market by revenue and subscribers, a doubling of their market share in just three years. The quick pace of growth has intensified competition between the telephone and cable companies’ TV distribution services. Like broadband internet access, the cable, satellite and IPTV industry is still largely a duopoly at the local level. 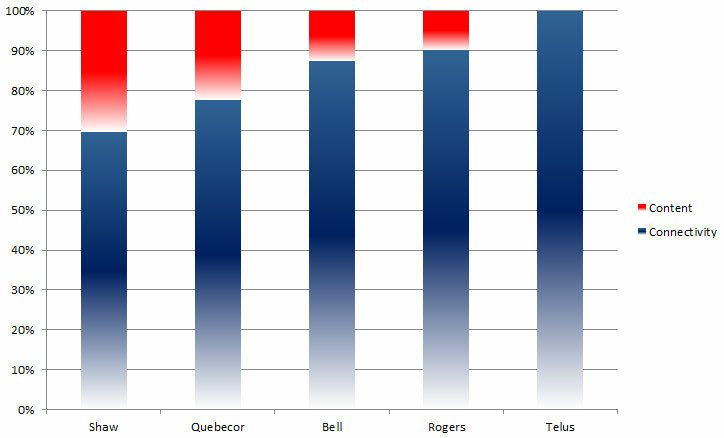 The “big four” control four-fifths of the market between them: Bell (26.5%), Shaw (23.2%), Rogers (18.7%), and Quebecor (11.8%). Add the next five largest players – Telus (8.4%), Cogeco (6.3%), Eastlink (3.4%), SaskTel (1%) and MTS (1%) – and pretty much all of the market is accounted for. Again, it is local and regional cable and telephone companies that dominate the sector, replicating the pattern of limited competition in yet another area of the platform media industries. Thus, while there is no doubt that competition has grown stronger in the television delivery business, concentration levels in the ISP market have not changed and those in the mobile wireless market are still remarkably high. Moreover, concentration levels have risen sharply across the telecoms and broadcasting landscape, as indicated earlier, over the past half decade. Whereas the “big five” – Bell, Rogers, Telus, Shaw and Quebecor — accounted for two-thirds of all telecoms and broadcasting revenue in 2010 that figure has soared to 84% in 2015. In sum, competition is growing in television distribution, but it is taking place within the context of greater concentration across the platform media overall and across the vertically-integrated telecommunications and broadcasting sectors. From the late 1980s until 1996, concentration in broadcast television fell sharply. The rise of specialty and pay TV channels magnified the trend. The television landscape became more diverse as a result. It was a major shift from an environment of relative scarcity to one of relative abundance. These trends in concentration levels reversed abruptly in the late-1990s, however, albeit with something of a lag before the specialty and pay TV market began to follow suit. After the turn-of-the-century concentration levels climbed steadily. The upswing since 2008 has been especially sharp. Figure 7, below, shows the trend for each of the content media industries in terms of CR scores; Figure 8 does the same in terms of the HHI. Sources: see the “CR & HHI” as well as individual sector sheets in the CMCRP Workbook. 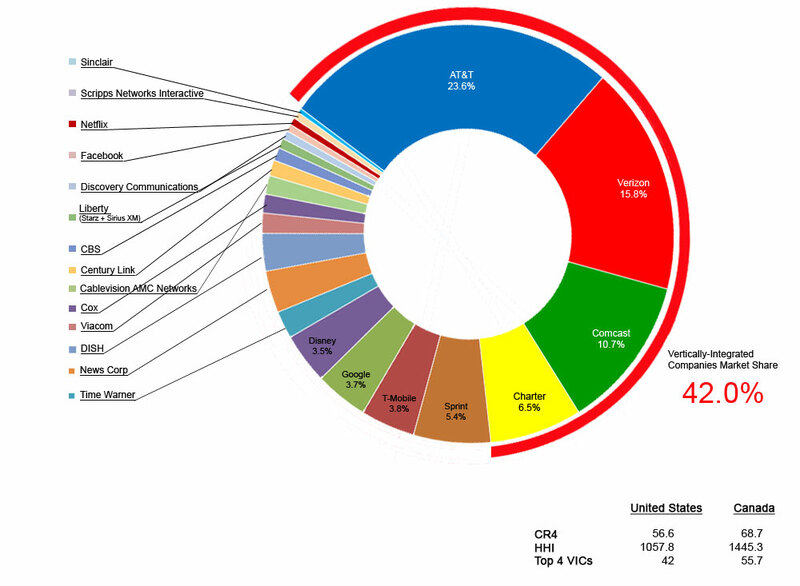 During the first half-decade of the 21st century, the “big four” accounted for 63% of the TV content business at a time when a handful of mid-range players such as Alliance Atlantis and CHUM had carved out a significant place for themselves in the TV marketplace (circa 2000-2006), respectively, before being absorbed into the maw of the industry’s largest players. By 2008, the “big four” accounted for 70% of revenue. In 2015, the four largest television groups – Bell, Shaw, CBC and Rogers — controlled 80% of all television revenues (including OTT services). Add Quebecor into the mix, and the number rises to 87% (see the “CR & HHI” sheet and specific sector sheets in the CMCRP Workbook as well as Television Channels by Ownership Groups). The recent upsurge in concentration levels in the television market is due mainly to four transactions. The first is Shaw’s take-over of Canwest’s television holdings in 2010. The second was Bell’s buy-back of CTV a year later. Given CTV’s status as the largest television company in the country, the deal pushed concentration levels up greatly. The third significant moment occurred when Bell and Rogers’ each took a 37.5% stake in Maple Leaf Sports Entertainment (i.e. NBA TV, Leaf TV and Gol TV) in 2012 (with Toronto Construction magnate Lawrence Tanenbaum’s Kilmer Sports holding the rest) (CRTC, 2012; Bell 2013 Annual Report, p. 133). The fourth step took place with Bell’s take over of Astral Media in 2013 after the CRTC reversed course from a year earlier when it curtly dismissed the deal. The increase in concentration was significant, even though Bell divested itself of eleven TV channels, as required by the Competition Bureau and the CRTC: Teletoon (TELETOON Retro/TÉLÉTOON Rétro, TELETOON / TÉLÉTOON, Cartoon Network), Historia and Séries+ to Corus (Shaw), the Family Channel, Disney Jr. and Disney XD to children’s television programmer, DHX media, and MusiquePlus and MusiMax to V Media. The CTV, MLSE and Astral transactions marked Bell’s return to the field after having abandoned its earlier ill-fated convergence fling in the ownership of CTV and The Globe and Mail (circa 2000-2006)(a phase in its history that is curiously missing from the company’s annual reports). These transactions put Bell at the top of the league. Concentration levels are high in broadcast television as well as pay and specialty channels. In broadcast television, the “big five” – CBC (43%), Bell (23.5%), Shaw (Corus) (14.6%), Rogers (7.2%) and Quebecor (TVA) (6.9%) – had a combined market share of 95.3%. The HHI is at the very high end of the scale: 2723. Specialty and pay services have been the jewel in the TV crown, but over the last year both the CR4 and HHI standards shot upwards from the “moderately concentrated” zone into the “highly concentrated” zone. Bell (35.1%), Shaw (25%), Rogers (13.7%), the CBC (3.9%) and Quebecor (6.6%) collectively accounted for 84% of specialty and pay TV revenues in 2015 — up substantially from the 72% share they held three years earlier. Bell and Shaw alone account for 60% of the market – down from the two-thirds market share they held the year before. Bell’s share of total TV industry revenues rose from 24.8% in 2011 to 29.3%. This makes Bell substantially larger than the second largest player in the television industry, Shaw (Corus), which had roughly 20% of market revenues in 2015. Together, just these two companies –Bell and Shaw (Corus) — dominate just under half of the total television market in Canada (49.3%). That concentration across the total TV market has been pushed to new extremes is also borne out by changes in the HHI scores. The ground shifted significantly from the competitive end of the spectrum in the 2000-2008 period with HHI scores in the 1,300-1,500 range, but then shot upwards into the moderately concentrated zone thereafter. The HHI score was 1848 in 2015 – down slightly from 1,959 a year earlier. Of course, there are several other players that round out the television landscape, some of which have been around for years, others that have come along lately: e.g. V Interactions, APN, Pemorex (the Weather Network), Radio Nord, Fairchild (Chinavision), Blue Ant, DHX, CHCH, CHEK, Channel Zero, etc. While no doubt important sources of diversity, their impact has been modest and their future is uncertain. Collectively they account for less than five percent of total television revenues. To put this another way, the market share ofall these entities combined is substantially lower than Astral Media — the last large independent broadcaster — on the eve of its take-over by BCE in 2013. Radio is amongst the most diverse media sectors. The shuffling of several radio stations between Shaw (Corus) and Cogeco in 2011 helped bring about the long-term decline in concentration. The presence of several mid-size radio station groups has also added to the relatively high diversity of radio station ownership: e.g. NewCap, Patttison, Rawlco, Maritime Broadcast, Golden West, etc. The downward drift, however, of recent years, however, was reversed in 2013 when Bell acquired Astral Media, then Canada’s largest radio broadcaster. The deal catapulted Bell into the being the biggest radio broadcaster in the country, ultimately adding 77 radio stations to the existing ones it already had, for a total of 107 radio stations operating in 55 cities across Canada. Bell’s 22% market share in 2015 was substantially larger than the CBC’s share (14.8%) and far greater than that of closest commercial peer, Rogers (12.5%). Bell’s acquisition of Astral has led to a significant increase in CR4 and HHI scores, and reversed the downward trend of the previous half decade. Even with this significant uptick, however, the radio sector is only modestly concentrated by CR4 standards in 2015, with a score of 58%. It is firmly within the competitive zone by the lights of the HHI, with a score of 1023. Bell’s divestiture of ten radio stations in medium to large size cities across the country at the end of 2013 and into 2014 helped offset the effects of consolidation. The effect of this sell-off has also be to strengthen some of the mid-size radio station ownership groups that acquired them: Newcap, Pattison and Corus (Shaw) (see the “Radio” sheet in the CMCRP Workbook). With some twists and turns along the way, concentration in the newspaper industry rose steadily from 1984 until 2000, then fell significantly for the next ten years before rising again. In 1984, the biggest four groups accounted for 64% of the industry’s revenues, a number that rose slowly but steadily over the intervening years to roughly two-thirds of the market in 1996 and then more sharply upwards until 2011. By 2011, the four largest newspaper ownership groups accounted for 84% of the market: Postmedia (24.9%), Torstar (24.9%), Quebecor (23%) and Power Corp / Gesca Media (13.3%) (see the “Newspaper” sheet in the CMCRP Workbook). Levels have declined since. By 2015, the CR4 had fallen to 77.8% and the HHI from 2017 to 1812 – well within the ‘moderately concentrated’ range of the HHI standards. These new conditions likely reflect Postmedia’s decision to sell some of its newspapers (e.g. Victoria Times Colonist) and to cut publishing schedules at others. Indeed, Postmedia’s market share has fallen steeply from 24% in 2010 to 19% four years later but shot up again last year after it’s acquisition of Quebecor’s Sun newspaper chain (6 major dailies, 27 small dailies and 140 community weeklies). By 2015, Postmedia alone had come to account for a third of the Canadian newspaper market, albeit one that was in disarray and shrinking (the Competition Bureau approved the transaction in early 2015). Concentration levels by the standards of the HHI reached an all-time high last year as well, at 2035 – firmly in the moderately concentrated level. A few new publishers have emerged by picking up some of the smaller dailies hived off from the larger chains and generally amidst the tough times facing the newspaper industry, notably Black Publishing and Glacier Publishing in western Canada. Moreover, several new internet news originators and sources have also emerged, such as iPolitics, the National Observer, Canadaland, Blacklock’s Reporter, the Tyee, Huffington Post, Buzzfeed, Vice, AllNovaScotia, Policy Options, etc., but as we also noted in the first report in this series, none of them even shows up in the top 60 online news sources in Canada and account for only a tiny portion of internet news traffic (see pp. 45-47). In other words, they serve small and highly specialized audiences (also see below). Of all media sectors, magazines are the least concentrated. 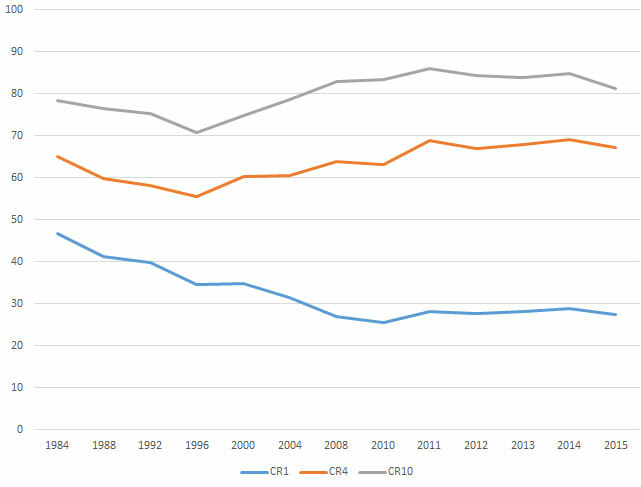 Concentration levels fell by nearly half on the basis of CR scores between 1984 and 2015, and by a multiple of ten by the lights of the HHI criteria since 1988 (see the “Magazine” sheet in the CMCRP Workbook). The CR4 was 25, and the HHI at the extremely low level of 218. That said, however, even the best available data for this sector is terrible and needs to be treated with caution. The internet has long been held up as an antidote to ownership concentration in the “old media”. Yet, as the earlier discussion of internet access showed, there is little reason to believe that core elements of the Internet are immune to such forces, and maybe even some good reasons to think that the opposite just might be the case. The discussion below examines the evidence in relation to several core elements of the internet ecology: internet advertising, search engines, browsers, operating systems and online news sites? It starts with a critical area that is remarkably unconcentrated and which appears to have become more and more diverse over time: internet news sources. As previous versions of this report have indicated, internet news sites have always been an exception to the high levels of concentration found elsewhere in both the online and ‘old’ media environments. The diversity of online news services did fall between 2003 and 2008 when the amount of time people spent on the top 10 online news sites nearly doubled from 20 to 38 percent of people’s time spent online. Moreover, it was also the case at the time, and still is, as we will see immediately below, that most of the increase in time that people spent on a dwindling number of sites went to sources that were extensions of well-known media outlets: CBC / Radio Canada, Quebecor, CTV, the Globe & Mail, Toronto Star, Post Media and Power Corp, as well CNN, BBC, Reuters, MSN, Google and Yahoo! (Zamaria & Fletcher, 2008, p. 176). However, even though there was a “pooling of attention” on the top 10 or so news sites, it was also the case that concentration levels were always at the lower end of the scale and drifted downward until 2011, the last point for which data was available from this early effort to map audience’s attention to internet news sources (see the “Online News” sheet in the CMCRP Workbook). For the last two years, I have obtained a new dataset from Comscore that brings us up-to-date. While the new dataset and the old one use different measures and are, thus, not directly comparable, the downward drift in concentration levels seen in the past has continued apace. Internet news sources are, in fact, amongst the most diverse of all the sectors reviewed in this report, except magazines. Table 2 illustrates the point. Canadians get their news from a wide range of sources on the internet. The CBC is at the top of the heap, while other familiar media enterprises from Canada also continue to loom large: e.g. Postmedia, Torstar, Quebecor, CTV, the Globe and Mail, etc. It is also clear that several new online sources of journalism have climbed up the ranks (e.g. Huffington Post, Yahoo!-ABC News, Buzzfeed, Vice). There’s also a significant number of quality US and UK news sources near the top of the list (e.g. the BBC, New York Times, the Guardian). The Weather Channel also stands out as one of the most important sources of news for Canadians. Internet advertising revenues have soared from a relatively small $141 million in 2000 to $4.6 million last year. The internet surpassed television as the largest advertising sector in 2013, and the gap between the two has continued to grow since. By 2015, it advertising accounted for 37% of advertising revenue across all media (IAB, 2015). The data, however, are not without their problems, and buried in the footnotes to the reports tallying up the numbers are cautionary words about the double-counting that takes place between the ‘online advertising revenue’ reported by traditional media companies’ revenues, notably newspapers, under their conventional areas of operation and under the umbrella of internet advertising in the surveys conducted by TVB and the Internet Advertising Bureau (see TVB Net Advertising Volume report, footnote 2 on this point, for example). That said, however, taking heed of these observations and building on the just-mentioned sources, company annual reports, as well as estimates of Google and Facebook’s revenue in Canada leads to a reasonable picture of current trends and recent developments in this area. In sharp contrast to internet news sources it reveals a picture of high levels of concentration. Indeed, internet advertising is highly concentrated by the standards of the CR4 and the HHI. As we noted in the first report in this series, in 2009, the top ten internet companies took 77% of all internet and mobile advertising revenue; by 2015, that number had risen to 86% (IAB, 2016, p. 9). 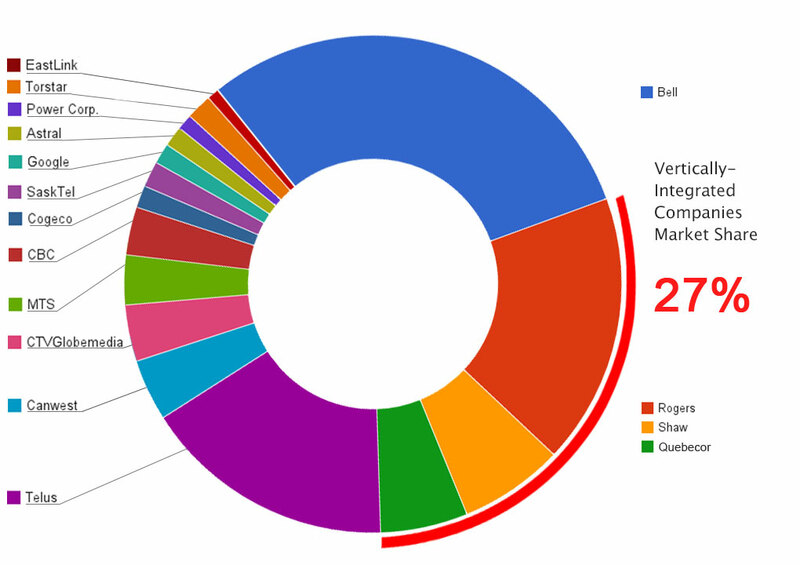 Table 3 below illustrates the point by highlighting the revenues and market share of nine of the largest internet advertising revenue recipients in 2015. Sources: IAB, 2015 Actual + 2016 Estimated Canadian Internet Advertising Revenue Survey, p. 4, company Annual Reports, and the entries under “Internet Other” sheet in the CMCRP Workbook. Table 3 also highlights the fact, when it comes to internet advertising, Google and Facebook stand in a league of their own. Indeed, the two combined account for an estimated two-thirds of internet advertising revenue in Canada last year. As a matter of fact, Facebook’s revenue alone is more than two-and-a-half times those of the entire newspaper industry’s online and mobile advertising revenue, i.e. $757.5 million versus $282.5 million (Newspaper Canada, 2016). 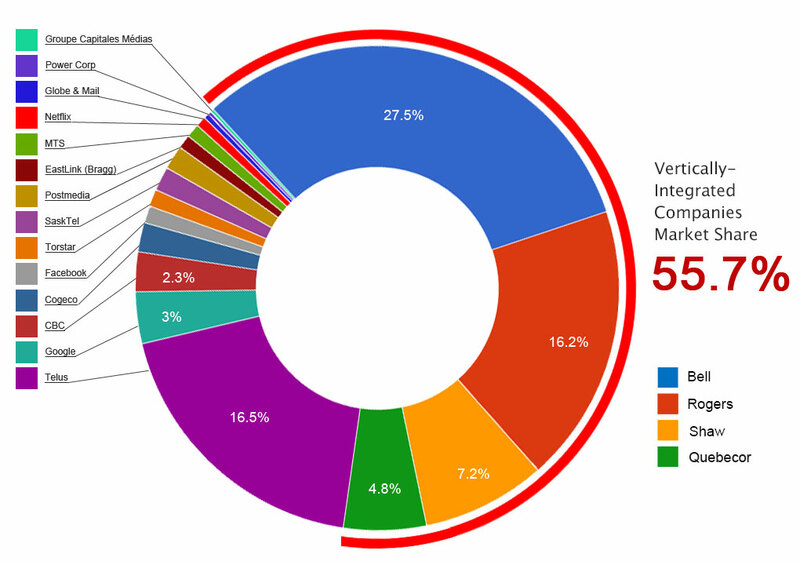 Google’s dominance of internet advertising flows from its dominance of the search engine market. Concentration levels in the search engine market have been persistently sky-high since 2004. CR scores have been well over 90, and HHI scores have been nearly off-the-charts in the 4000-7000 range (remembering that 10,000 represents the upper limit of the HHI scale, or total monopoly). This is another core element of the internet that is far from being immune to processes of consolidation. Indeed, internet search is amongst the most concentrated of all of the different segments of the network media ecology — by far. Google’s dominance rose sharply from the mid-2000s until the end of the decade, where it hovered in the low 80%-range. It’s share of the market dipped in 2012 but that was short-lived. As of 2014 – unfortunately, the last year for which quality data is available — the search engine giant dominated search in Canada with over three-quarters of the market share, with Microsoft (10.4%), Yahoo! (5.7%) and Ask.com (2.1%) trailing far, far behind. CR4 and HHI scores were sky-high at 94% and 5891, respectively. Table 4 depicts the results. Sources: Experien Hitwise Canada. 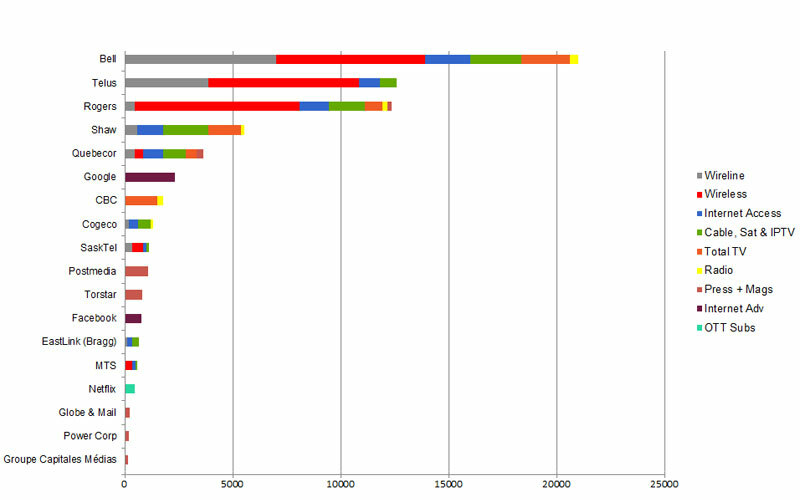 “Main Data Centre: Top 20 Sites & Engines” and “Hitwise Canada Online trends“. Last accessed October, 2015. Social network sites display a similar but not as pronounced trend. Again, however, the data is limited and dries up after 2013. However, that data is still useful in terms of illustrating the point that far from being immune to the forces of consolidation, many core elements of the internet are extremely concentrated. Thus, in March 2013. Facebook accounted for 46% of unique visitors to such sites, followed by Twitter (15%), LinkedIn (12%), Tumbler (12%), Instagram (9%) and Pinterest (6%) (Comscore). With a CR4 score of 85% and an HHI of 2762, social networking sites are highly concentrated. With respect to other core elements of the internet ecology, current levels of concentration can be best described as sky-high. Take desktop web browsers in Canada, for example. The top four companies — Microsoft’s Explorer (49.1%), Google Chrome (32.2%), Firefox (12.2%) and Apple’s Safari (4.3%) — have a combined market share of 97.7 percent and an HHI of 3613 (Netmarketshare). Similar characteristics hold for mobile browsers, albeit with a different rank ordering of the players. Just two companies account for nearly three-quarters of the market — i.e. Apple’s Safari is 40.5% and Google Android or Chrome browser is 33.1%. Opera 6.4% and Microsoft Explorer with 2.5% lag far behind. The upshot is extremely high levels of concentration on the basis of both the CR4 (82.5%) and HHI (2783) scores (Netmarketshare). While concentration levels are still firmly in the highly concentrated zone, they have fallen signficantly in the face of the significant growth and adoption of Google’s Android operating system, and less so but still significantly, the Opera operating system. Similar patterns prevail once again in terms of desktop and smartphone operating systems. When it comes to desktop operating systems, three entities account for 100% of the installed base (Microsoft Windows, 91.1%; Apple OS X, 7.4% and Linux at 1.6%). The HHI is at the extreme end of the scale at 8357, given Microsoft’s control of in excess of 90% of the installed operating systems. This situation has stayed remarkably constant over the years and even trended upwards significantly in recent years. For smartphone operating systems, the top four players accounted for 96% of the market: Google’s Android OS (51.8%), Apple’s iOS (39.8%), Java (2.6%), Nokia’s Symbian (2.2%). Microsoft (2.5%), RIM (1.1%) and Kindle accounted for the rest. Again, the significant growth and adoption of the Google Android operating system for mobile phones stands out, and in fact replaced Apple at the top of the rankings in 2015. The HHI score was 4,286 at the time (Netmarketshare). The following paragraphs draw this report to a close by combining all the bits and pieces into a bird’s eye view of long-term trends across the network media economy as a whole. Figures 9 and 11, below, start the process by showing the trends across the network media economy over time on the basis of CR1, CR4 and CR10 scores, followed afterwards by a depiction of the trends based on the HHI. Sources: see the “CR & HHI” sheet in the CMCRP Workbook. Looking across the entirety of the network media economy, several distinct points emerge: The biggest company’s share of revenues across the media three decades ago was 47%; in 2015, it was much less, but still a very large 28%, and within a vastly larger media universe. That company in 1984 was BCE; it still is today, and it is far larger than the second and third-ranked firms, Rogers and Shaw. Moreover, BCE’s share of the total network media economy has stayed relatively constant over the past half-decade. The CR4 for the whole of the network media economy in 2015 (68.7%) was a little higher than it was three decades ago, but up considerably from its low point in the mid-1990s. At present, Bell (27.5%), Rogers (16.2%), Telus (16.5%) and Shaw (7.2%) make up the ‘big four’. The most significant and far-reaching change in recent times, however, is the ascent of four giant vertically-integrated telecoms-internet and media conglomerates: Bell, Rogers, Shaw and Quebecor. They accounted for 55.7% of total revenues across the network media economy last year. Add Telus to the fold and the market share of the top five Canadian telecom, internet and media companies swells to 72.1%. The largest ten firms accounted for 81.3% of all revenues across the network media economy as a whole in 2015 – down significantly from 85% a year earlier. By contrast, however, the figure hovered in the low- to mid-70% range in the 1990s, and today remains modestly higher than levels in place in the early 1980s. Once again, the idea of a “u-shaped” curve fits the trends. All-in-all, after taking account of the top four or five firms, there is a distant second tier of a dozen or so more specialized media, internet and telecoms companies that, combined with the tier one firms, account for 87% of all revenues in the network media economy: e.g. Google, the CBC, MTS, Cogeco, Sasktel, Torstar, Postmedia, Eastlink, Facebook, Power Corporation, Netflix, Globe and Mail and a relative newcomer, Groupe Capitales Médias. Figure 10 shows their respective rank order based on their Canadian revenues. A notable change in the past few years is the fast rise of internet companies up the ranks of the leading media, internet and telecoms companies in Canada. Google’s fast ascent through the ranks to 6th place by 2013 and remaining there ever since stands out in this regard. It is now second only to the tier one players – e.g. Bell, Rogers, Telus, Shaw and QMI – but with a greater share of the media economy then traditional mainstays on the media landscape in Canada such as the CBC, Globe and Mail, Torstar and so on. Facebook and Netflix also cut significant figures but are still modest in their standing within the overall media economy, although not in their respective areas of specialization. Netflix’s estimated revenues of $447.1 million represented just under 6% of total TV revenues in 2015, a substantial amount that places it just behind Quebecor’s TVA in the television sector, and ahead of all the main independent television groups combined, i.e. V Interactions, DHX, APN, Pelmorex/the Weather Channel, Radio Nord, Blue Ant and Fairchild. For its part, Facebook’s estimated Canadian revenues of $757.5 million accounts for 16.5% of internet advertising revenues in Canada. While modest within the overall media economy, a better sense of the scale of Facebook’s impact is gained by looking at those areas where it is mostly likely having a significant impact on existing media players, for instance, newspapers who see themselves as battling with digital media giants for advertising revenue. As indicated earlier Facebook’s estimated advertising revenue was more than two-and-a-half times as much as the entire newspaper industry’s online and mobile advertising revenue in 2015 (Newspaper Canada, 2016). Figure 11 below offers another portrait of concentration trends for the network media industry as a whole, but this time using HHI rather than CR scores. As with the CR scores shown earlier, Figure 11 also shows a ‘u-shape’ pattern. If we take HHI scores for the ‘total media universe’ as the beginning and endpoint of our analysis, this is our conclusion: concentration levels have fallen substantially over time across the overall media economy. They are much lower than they were at the turn-of-the-21st century and a far from cry from what they were in 1984. This is exactly what observers who argue that any continued concern with media and internet concentration is both wrong and wrong-headed, such as Ben Compaine, Ken Goldstein and Brent Skorup and Adam Theirer, tend to do. That conclusion is problematic for several reasons. First, the long–term decline that it implies has been thrown into reverse since 2010, with a significant rise in the years thereafter where things have generally stayed steady in high 1300 to high 1400-range. While the decline since 1984 brought the overall HHI firmly into the competitive zone of that measure’s standards, the reversal in the last five years has brought levels close to the moderately concentrated zone. This represents a very significant change over a very short period of time. Second, by taking the “bird’s eye” view as the beginning and end of the story the conclusion of those who argue that things are just fine obscures trends at the sector-by-sector and category level analysis, e.g. platform media, content media and online media. We use the “scaffolding method” precisely to pick up on such dynamics, whereas starting at the opposite, high-end view, and sticking within it the whole way through, dulls the sensitivity of the HHI method in relation to sector- and category-specific changes. Moreover, given the reversal of long-term trends within many sectors and across the media economy as a whole drawing conclusions about the ‘fiercely competitive’ state of the telecoms, internet and media industries at this time would be to prematurely foreclose the end of the story. In contrast, the ‘scaffolding approach’ reveals a more variegated portrait that is sensitive to changes in specific sectors, categories and the network media as a whole. Figure 12 below gives a snapshot of the network media in 2015, listing sectors where concentration was low, those that were moderately concentrated, and those that were highly concentrated by HHI standards. Several things stand out from this exercise. First, we are nowhere near a time when studies of telecoms, internet and media concentration are passé. Indeed, theoretically- and historically- informed, and empirically-driven, research is badly needed because there is such a dearth of quality data and independent research available. The concerns addressed in this report do not belong to a distant past rendered obsolete by new technological and economic realities but are intimately intertwined with the events of the day. The trends observed above are similar to those seen in the US and many other countries around the world (see Noam, 2016). Concentration levels fell sharply in the 1980s and part way through the 1990s, but were followed by a reverse tide and steep rise in the second half of the 1990s. 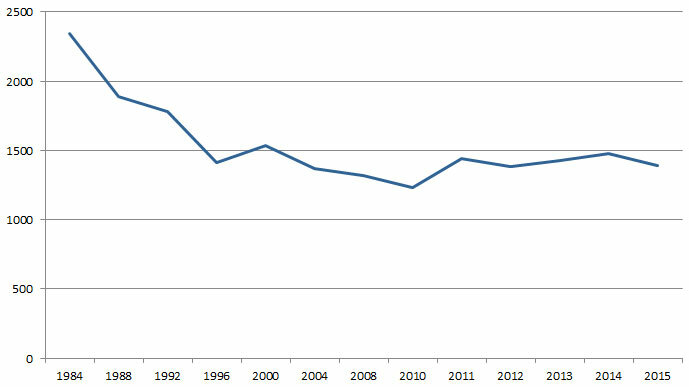 Of course, details differ from one medium to the next, and from country to country, but the general trend in Canada, like the US, was similar, with the steep upward rise of the late 1990s peaking by 2000, followed by relatively constant levels at this high point for the decade that followed. The last five years have once again seen a slight uptick in most of the ‘platform media industries’ and a very sharp rise within each of the segments of television covered by this report. The overall effect has been a substantial rise in concentration levels. The platform media industries and most of the core elements of the internet, including internet advertising, search, browsers, operating systems and social network sites, are the most concentrated. Concentration levels in these sectors are “astonishingly high”, as Eli Noam has stated (p. 8). This is certainly true of Canada. These realities undergird the towering role that internet media giants like Google, Facebook and Netflix now play in Canada. Of course, these trends are not all to one side and the case is more varied in the content media industries. 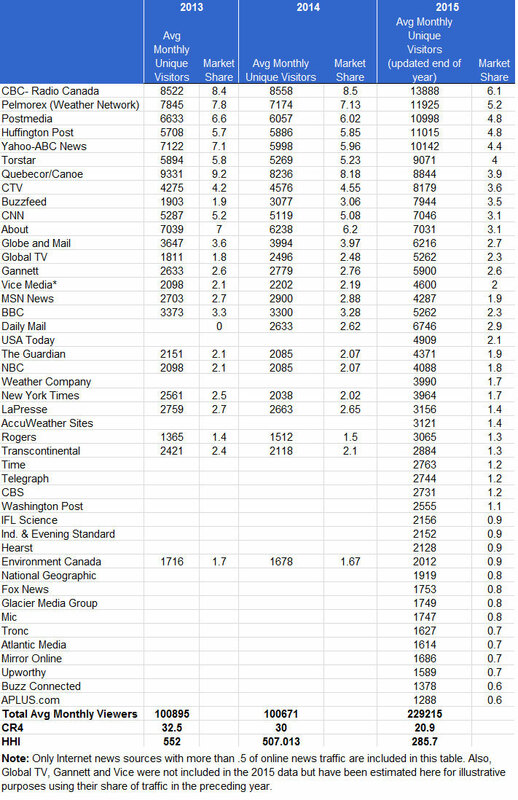 As we have seen, internet news sources frequented by Canadians are defined by “astonishingly high” levels of diversity, and not just from within the country, but reaching beyond national borders to pick up highly-respected journalistic organizations from the U.S. and U.K. in sizeable numbers. Magazines and radio also fall at the high end of the diversity spectrum as well. Some new players such as TekSavvy (internet access), Blue Ant (TV) and iPolitics (online news) have added diversity to the media landscape as well, but their impact has been modest and, for some, their future uncertain. While there are important cross-cutting trends and areas where diversity rules, the evidence is clear: there are high levels of concentration within most sectors of the telecoms, internet and media industries, and across the network media economy. Moreover, that levels of telecoms, internet and media concentration are high is not a product of mere speculation or allegations but established legal facts. The CRTC has rediscovered media concentration in the past few years, and taken bold steps by the standards of the past to do something about it in a series of landmark rulings: e.g. the Mobile TV, Talk TV as well as regulated wholesale mobile wireless and wireline decisions. On each occasion, the Commission’s message was clear: “Incumbent carriers continu[e] to dominate the retail Internet access services market”. There has been little change in such realities over time. New technologies, whether 4G LTE mobile wireless services or the next generation fibre broadband internet access networks being brought to more and more Canadians’ doorsteps do not obviate such concerns one iota but demand a firm hand at the tiller to ensure that the same kinds of problems that exist today do not become those of tomorrow. As this report has shown, however, it is not just high level of concentration that is at issue but the specific form it has taken in Canada. Indeed, Canada stands out relative to the rest of the world in terms of its extremely high levels of diagonal integration between different “platform media” (e.g. mobile wireless, internet access, BDUs) (essentially, telecoms operators), and vertical integration between telecoms operators and TV (other media content). We have dealt with this at length in three other reports this year, so will only highlight a few of the key points here (see here, here and here). In terms of diagonal integration, all the main distribution networks (mobile wireless, wireline, ISPs and BDUs) are typically owned by one and the same player, whereas in many countries there are stand-alone mobile network operators (MNOs). As a matter of fact, Canada is unique in the extent to which mobile wireless and wireline infrastructures are integrated into single companies, with the last stand-alone MNO – Wind Mobile – having been just acquired by Shaw, thereby removing the last stand-alone MNO from this market as a result. In the US, T-Mobile and Sprint are stand-alone MNOS; while stand-alone mobile providers are common in other countries: Vodafone is an good proxy for this given the many places it operates in, although it also operates wireline networks in a few countries as well (e.g. New Zealand). High levels of diagonal integration matters for at least three reasons. First, diagonally integrated companies, as opposed to their stand-alone counterparts, often manage demand, rivalry and prices across each of their “platforms” with one eye cocked on their stand-alone MNO rivals and the other to ensure that one branch of the firm does not cannibalize another. Second, it matters because when different companies own competing networks in separate markets, concentration levels are usually lower. Third, it also matters because it affects the services on offer in terms of affordability, data allowances, availability, and so forth. As the consultancy Rewheel shows, for example, stand-alone maverick mobile operators (e.g. Free in France, Hutchison 3 in the UK, or T-Mobile in the US) “sell 8 times more 4G gigabyte volume allowance than the EU28 operators that belong to groups that have fixed-line broadband interests”. In other words, diagonal integration serves to blunt the sharp edge of competition by restricting data allowances which, in turn, limits the impact of mobile wireless services on fixed, wireline services. A similar logic also checks the impact of the internet on the cable television distribution model, which both the large incumbent network operators and cultural nationalist policy groups seek to leverage as a means of maintaining a broadcasting distribution undertaking- (BDU-) centric model of the media universe, as we noted in another research report earlier this year. Vertical Integration in Canada is also extremely high by historical standards, and has soared since 2008. It is also high in comparison to US and international standards as well, as we have seen. Indeed, Canada is unique in the world given that extent to which all of the biggest TV services, except the CBC, are owned by telecoms operators. While Canadian regulators have countenanced these developments in the past, they have begun to reject the North American “free market model” orthodoxy that brought about these conditions to begin with. A key question on the horizon, however, is if the incoming Trump Presidency will reset the clock, as seems likely given Trump’s inclinations and that of chief telecoms policy advisor, Jeffrey Eisenach, who has also not only called for the dismantling of communications specific regulation and policy in favour of general competition law but served the incumbent telcos in Canada as well on numerous occasions (see here, here and here, for example). In the meantime, however, the sensibility appears to be as much market as can be had, but robust regulation when necessary. The incumbents have fought the current drift of events tooth-and-nail. Bell, for instance, has done so by flooding the courts with appeals of several CRTC decisions in the last few years (see here, here and here) and by landing a petition to Cabinet on the desks of the incoming Liberal Government before it was even in office, although that appeal, as we saw earlier, was rebuffed by the incoming Cabinet early in its mandate, and to its credit. The lobbying front has also been in full swing in support of the companies’ stance on these matters and against any more attempts “to achieve greater competition”, with the C.D. Howe Institute calling on the new government to change course in line with the incumbents’ view of the world. The Globe and Mail has published the Institute’s call in its op-ed pages, just as the National Post has done for similar reports produced by the Macdonald Laurier Institute. In fact, the marketplace of ideas has been flooded with reports by the incumbents’ hired guns and industry-friendly think tanks like the Fraser Institute, the Montreal Economic Institute or the MacDonald Laurier Institute. This push to restore the incumbents’ preferred view of the world is nothing new for the Institute, having promoted similar views for years (see here and here). What is of the moment, however, is the speed with which this bastion of the well-connected has laid these views at the feet of the new government and the fact that the chairman of the C.D. Howe Institute, Bill Morneau, has now taken a place in federal public office as the Liberal Government’s Minister of Finance. The connections between governments and industry, and especially the telecoms and media industries, have been a perennial feature of the political economy of media in Canada in the past and have not served us well. The Trudeau government must avoid being captured by such forces during its time in office and the conflicts of interest, perceived and real, that these relationships foster. In short, high levels of telecoms, internet and media concentration are reality. What is to be done, if anything, about this state of affairs is a political question. On that, we need to take bold steps to help bring about the kind of communications environment we want. The Liberal Government should double-down on the course charted by the Conservatives, albeit in ways that reflect even more ambition and a broader conception of the role of the internet, media and telecoms in Canadian society, business, politics, culture and everyday life. The top-to-bottom review of communication and cultural policy now underway under the auspices of Minister Melanie Joly and the Department of Canadian Heritage that she leads could be a valuable step in this direction, although to succeed the Liberals will have to resist the steady flow of pleading coming from many corners of the industry (although not all) and reinvigorated cultural policy nationalists who wish to tie the evermore internet- and mobile wireless-centric media ecology to their anachronistic and parochial views of communication, culture and media policy. To close, it’s important to keep in mind that we are living in what historians call a “constitutive moment” when decisions taken now will influence the course of events and the shape of the media environment we inhabit for years, even decades, to come. Once such decisions are made, the structures of the new medium of human communication that we are still struggling to come to grips with now – the internet- and mobile-centric media ecology — will become part of the woodwork, and stay that way for a long time to come. We hope that this report and the others in this series will contribute to better decisions, made on the basis of evidence, and a broad view of the importance of communications to all members of society. Discussions of these points tend to distinguish between “horizontal” and “vertical” integration. I follow Gillian Doyle (2013) to add a third type: “diagonal” integration. In this conceptualization, horizontal integration refers to ownership transactions within a single market; diagonal integration refers to transactions across markets at similar levels of the “value chain”, for example, between a company operating as a BDU and a competing or complementary distribution network like an ISP or mobile wireless network. Shaw’s take-over of Wind Mobile in 2016 is an example of this. Vertical integration occurs when a company takes over another firm that is upstream or downstream in the production chain, and is usually of two types: the first is where those who own the distribution network own TV and other content services delivered over them, while a second type involves, for example, integration between those who produce TV and film content and those who package and distribute it. Disney is an example of this, given that it owns one of the main Hollywood film studios and the ABC TV network as well as many specialty and pay TV services. The numbers would be 85% and 92%, respectively, if the tally for “total TV” did not include OTT services, as this report has done in the past. While we have treated such services separately since 2011, this year we have also folded them into the definition of “the total TV” universe. Two of these studies, Church and Wilkins (2013) and Navigant (2013), were funded, at least in part, by incumbent wireless carriers, by Rogers in the first case and Telus in the latter. See footnote 7, Winseck, D. (2014). Mobile Wireless in Canada. Wolter Lemstra and William Melody’s (eds)(2014). The Dynamics of Broadband Markets in Europe is a smart addition to the literature that takes a more scholarly versus “hired gun” approach. The number of subscribers for TekSavvy is the average between the number of subscribers at the end of the previous year and at the end of the current year; for Eastlink it is based on early 2015 numbers. The CR method adds the shares of each firm in a market and makes judgments based on widely accepted standards, with four firms (CR4) having more than 50 percent market share and 8 firms (CR8) more than 75 percent considered to be indicators of media concentration (see Albarran, p. 48). In Canada, the Competition Bureau uses a more relaxed standard, with a CR4 of 65% or more possibly leading to a merger review to see if it “would likely . . . lessen competition substantially” (p. 19, fn 31). See Competition Bureau (2011). Merger Enforcement Guidelines http://www.competitionbureau.gc.ca/eic/site/cb-bc.nsf/vwapj/cb-meg-2011-e.pdf/$FILE/cb-meg-2011-e.pdf para. 5.9. The sum exceeds 100% by a small amount because the revenue figures that I have arrived at for the telcos’ IPTV services are based on the companies’ audited annual reports at year end and higher than those they report to the CRTC, and for reasons explained in the last post. Telecoms includes wireless, wireline and internet access; media includes TV, radio, newspapers and magazines. Newspaper Canada redefined daily newspapers in 2014 as those that are published a minimum of four times a week and free daily papers such as the Metro papers available in large Canadian cities versus the traditional definition of every day of the week, except in some cases Sunday, as has long been the standard in the industry. The number reported here is for paid dailies that publish at least four times a week. There are only 86 dailies using the traditional, more restrictive definition based on publication at least six times a week.